Today you’re going to learn how to ask what someone’s job is. Now, we all learn this phrase in school: What is your job? This is okay. Nothing is wrong with that, except it sounds a bit too direct. And you may feel a little awkward asking this question because it can be a very personal question after all. Well, the next time you want to ask what someone’s job is, use “What do you do?” instead of “What is your job?”. All right? I’ll discuss how to answer this question on the website. So, please make sure to come visit us on Thursday. In the meantime, here’s a little quiz for you. I’ll give you three sentences. Please listen carefully and choose the one that is TRUE. Ready? 1. In this session you’ve learned how to ask what someone’s hobbies are. 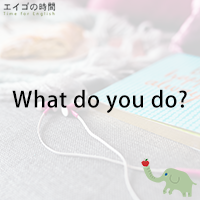 でもご心配なく。ちゃんと別の言い方があります。それがこちら。What do you do for a living? これで「あなたのご職業は（何ですか）？」という意味になります。末尾の単語三つ、for a living はしばしば省略されます。で、What do you do?